An institution will not do well if it is internally incoherent, if contending forces within its body are pulling it in different directions. Political parties rank high among the institutions of governance in a democracy. With one or two exceptions, parties in Pakistan have broken up as a result of factional conflicts and thus suffered loss of effectiveness. This is not a new, or even recent, development; it afflicted Pakistan Muslim League, successor to the party that had brought this country into being, within weeks of its inception at both the central and provincial levels. I propose to discuss below factional conflict between Nawab Iftikhar Hussain Khan of Mamdot and Mian Mumtaz Mohammad Khan Daultana in the Punjab Muslim League during the first six years following independence. Nawab Mamdot, president of the Punjab Muslim League, became chief minister of the province on August 16, 1947. Mumtaz Daultana and Sardar Sahukat Hayat joined his cabinet as ministers for finance and revenue respectively. In December Daultana and Shaukat Hayat began to protest that Mamdot ignored the cabinet and instead relied upon the advice of a few civil servants and some of his cronies, particularly Hamid Nizami, editor of Nawa-i-Waqt. They threatened to resign. The conflict between them became known and spread to the party organization at the district level. Mr Jinnah summoned the three men to Karachi, tried to impress upon them the perils the country faced and the need for a stable and effective government in Punjab. Sensing that Daultana was intellectually more accomplished than Mamdot, he offered to take Mamdot as a minister in the federal cabinet and leave Daultana to be the chief minister in Punjab. But Daultana became coy and denied that his differences with Mamdot arose from personal ambition. Mamdot, on his part, promised to change his ways. 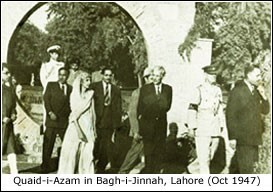 Mr Jinnah urged them to forget their past differences and work as a team. They returned to Lahore and declared their resolve to follow his advice. But within days they began to quarrel again. He called them back to Karachi but could not bring them to a satisfactory resolution. He left it to Sir Francis Mudie, the governor of Punjab, to deal with these men. After consulting “knowledgeable” persons, the governor found that, left to themselves and without knowing Mr Jinnah’s mind on the subject, the majority in the Muslim League party in the provincial legislature would side with Mamdot. Indeed, Mamdot removed any doubt on this score by calling a meeting of the party and obtaining a vote of confidence on May 20, 1948. The governor sought further advice from Mr Jinnah, but he declined to intervene. A week later Daultana and Shaukat Hayat resigned their posts in the Mamdot ministry. Following Mr Jinnah’s death, Prime Minister Liaquat Ali Khan urged Mamdot to invite Daultana back into his cabinet. He agreed but later changed his mind and told the prime minister that he could not work with Daultana. As a result, the latter felt insulted. He turned his attention to the party organization, which had scheduled elections of its office bearers for November 25, 1948. He decided to run for the office of party president against Mamdot’s nominee, Alauddin Siddiqui, and won by a small margin. Addressing the the party’s district presidents and secretaries, he compared its council with a parliament to which, he said, the provincial government must be accountable. He and his followers demanded Mamdot’s resignation for having failed to meet the people’s problems. At the same time he began a campaign to build support in the Muslim League party in the provincial assembly. As one might expect, the MPAs demnded favours from Mamdot, and promises from Daultana, in return for their support. The competition between them spread not only to lower levels in the party organization but also to various echelons in the public service. Hafiz Abdul Majid, chief secretary to the provincial government, protested against political interference in the day-to-day work of public officials but Mamdot’s friends convinced him that the chief secretary had spoken as Daultana’s partisan. By December 1948 Daultana had secured the support of nearly one half of the Muslim League MPAs, who signed a statement calling for Mamdot’s resignation, but he chose to ignore them. The Punjab Muslim League Council held a meeting towards the end of that month, presumably to censure Mamdot, but his supporters called in gangsters to disrupt it. About this time Daultana, acting as president of the provincial Muslim League, advised Prime Minister Liaquat Ali Khan to dismiss the Mamdot ministry, dissolve the Assembly, and order new elections. Liaquat Ali Khan came to Lahore in January 1948 and Daultana presented him a list of 42 Assembly members (out of a total of 81) who had signed pledges of support to him. Mamdot submitted a list of 44 supporters of his own. The prime minister noticed that seven names and signatures appeared on both lists. He could have asked the governor to call the Assembly to show where majority support lay. Instead he asked the governor general to dismiss the Mamdot ministry, dissolve the Assembly, and place the province under governor’s rule. This was done on January 24, 1949. It became the first instance in which the central government dismissed a provincial ministry even though it had not lost majority support in the legislature. His honour having been avenged, Daultana was now ready to relent. He gave up the party president’s post in favour of Mian Abdul Bari, a compromise candidate acceptable to both factions. Not only Mamdot and Daultana but politicians as a class now lost influence in the administration. Public officials paid no attention to their demands or pleadings. Fearing loss of constituency support, Muslim League politicians alleged that Governor Mudie was bent upon ruining their party and requested his recall. In November 1949 Liaquat Ali Khan authorized the Punjab Muslim League to nominate persons of its choice to serve as advisors to the governor in various departments. Mudie did not like this arrangement, resigned, and Sardar Abdur Rab Nishtar took his place. The advisors remained in office until August 1950. By this time Mamdot and Bari had come closer together. Daultana turned against both of them and the advisors. He spent the first few months of 1950 consolidating his support and building opposition to Mamdot and Bari within the party organization. A meeting of its council was scheduled for July 24 during which Daultana intended to move a resolution to censure the advisors, especially Malik Mohammad Anwar, their chief. Mamdot’s group prepared to condemn Daultana’s campaign against the advisors. The meeting became chaotic. Unable to maintain order, Mian Bari adjouned it and left along with his supporters. Daultana and his group, which apparently constituted a majority of the council, remained and passed the motion against Malik Mohammad Anwar. Feeling repudiated, Mian Bari resigned and Sufi Abdul Hamid, a Daultana nominee, replaced him on August 20, 1950. Thus Daultana regained control of the party organization. Soon the advidors resigned also. Depressed, and assuming that Liaquat Ali Khan and other party dignitaries would support Daultana, Mamdot concluded that it would be futile for him to compete for power within the framework of the Muslim League. He left the party and formed his own Jinnah Awami Muslim League in which Mian Bari joined him. This was admission that he had lost to Daultana, or that Daultana had chased him out of the arena. The Muslim League won a landslide victory in the Punjab Assembly elections in March 1951. At a meeting on April 3, presided over by Liaquat Ali Khan, the party MPAs elected Daultana as their leader, whereupon he became the new chief minister. But he would not last even two years in the office he had worked so hard to attain. His government failed to quell, and in some versions may even have encouraged, an anti-Ahmadiya movement, which turned into a rebellion against the state. On March 6, 1953 the army moved in, imposed martial law, and took over the government. Daultana, under Prime Minister Nazimuddin’s advice, resigned and took an extended vacation abroadd. The central government placed Firoz Khan Noon as the chief minister of Punjab after martial law was lifted later in the year, and to his removal from office Daultana now devoted himself. But that is another story and we will not go into it here. The factional conflict described above did not proceed without the involvement of leaders and rulers at the national level. Mr Jinnah did not take sides while he lived, but Prime Minister Liaquat Ali Khan was known to favour Daultana for several reasons. They had better rapport than either of them had with Mamdot. They were both well educated, having attended reputable universities in India and England. They professed to be progressive in their outlook. Knowing that the prime minister favoured his rival, Mamdot on his part did not hold him in high regard. His friend, Hamid Nizami, often criticized Liaquat Ali Khan in his editorials in Nawa-i-Waqt, and denounced Begum Liaquat Ali’s bearing and demeanour, and her work for the advancement of Pakistani women, as un-Islamic. But above all, Liaquat Ali Khan needed political support in Punjab which, he thought, Daultana could provide more than Mamdot. He had been elected to the Indian legislative assembly from East Bengal in 1945, because the provincial Muslim League had nominated him for election from a local constituency. But he had no personal standing or ongoing support there. Nor did he have a support base in West Pakistan outside of the Urdu-speaking Mohajir concentrations in urban Sindh. Politics in Punjab were dominated by landed aristocrats. Liaquat Ali Khan had no land in Pakistan. Mamdot’s lands were left in India and what he obtained in Pakistan did not amount to much. Daultana, on the other hand, was one of the largest landlords in the province and his influence among other landed aristocrats was considerably greater than that of Mamdot. No wonder then that Liaquart Ali Khan preferred him as an ally in Punjab. Factionalism in Punjab and Sindh is partly a function of the feudal ethos that pervades their politics. I have written on this subject before, and I shall limit myself here to a few observations. It needs to be emphasized that the ideas of the public domain and the public interest are foreign to feudal thinking. The feudal lord recognizes no interest other than his own and that of his family or, at the most, his clan. He has therefore no interest in, and no tradition of, working with others in cooperative relationships for achieving common goals. He does not subscribe to them. He believes in the efficacy of physical force as a means of promoting his ends. He is subservient to superior power centres while they are ascendant but will withdraw obedience if and when they go into decline. He will fight equals and demand deference from inferior stations. If they deny him deference and want to go their own way, he will use force to humble them. His alliances are shifting in nature and made for reasons of expediency. He expects loyalty to his person, not to ideas or platforms, from those who associate with him or work for him. Personalism is thus the hallmark of his relationships, be they alliances or rivalries. Mian Iftikhar-ud-Din, an avowed socialist, founder and original owner of the Pakistan Times, had joined the Mamdot ministry but left both the government and the party after a few months because of policy differences with his cabinet colleagues. Daultana was also said to have socialist leanings by way of intellectual persuasion but he was no socialist in his practice. There were no perceptible policy differences between him and Mamdot. They were rivals only for personal pre-eminence and power. They were, in their outlook, both feudal lords. It is amazing, but a fact nevertheless, that higher education and exposure to the values and ways of modernity do little to overcome the deeply ingrained influences of a feudal upbringing. Daultana, Mamdot, Firoz Khan Noon, Mushtaq Ahmad Gurmani, Dr Khan Sahib, Zulfikar Ali Bhutto and his latter day associates, all partook of the same frame of mind. Another deplorable fact about the feudal ethos is that it does not remain confined to the great landlords. It travels to other sections and ranks in society. Thus, personalism became a dominant factor in the outlook of those in positions of power even if they had never been large landowners. Witness the disposition and style of Ghulam Mohammad, Iskander Mirza, Ayub Khan, Ziaul Haq, and currently Pervez Musharraf (among many others). This entry was posted in Blast from the past, Handbook For the future politicians, Pakistan Between 1947-1958, Qaud e Azam's Pakistan. Bookmark the permalink. Where is the country Heading?